This startup story features Kevin Plank, a former Fork Union Military Academy Football player who turned sweat into a billion dollar business. Famous For: Creating a revolutionary new T-shirt built from microfibers that wicked moisture and kept athletes cool, dry, and light. As a 23 year old former captain of the University of Maryland Football team, Plank had noticed that compression shorts stayed dry during practice. He decided to take that same material to create moisture wicking gear. Under Armour’s original funding came from Planks personal savings and credit card debt. During college, Plank had saved about $20,000 by selling t-shirts at concerts. He ended up going about $40,000 in credit card debt spread across five cards. By 1997 (one year after founding the company), he was broke. Then, he made his first sale to Georgia Tech for about $17,000. Two dozen NFL teams soon followed suit. At the end of his second year, he had sold $100,000 in product. Then, the product took off and major teams and retailers began carrying the product, creating a multi-million dollar business that now does nearly $2BB in sales and has over 5,900 employees. While Under Armour’s initial funding came from Plank himself, the company went public less than 10 years after it’s founding to raise $115 Million for expansion capital. The stock doubled in its first day of trading. The company has since sold additional shares of the company to help fuel it’s continued growth. 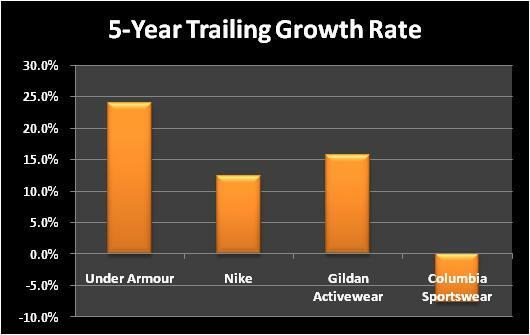 Below, is a chart of the companies trailing five year growth rate compared to it’s competitors. 1995: Plank comes up with the idea for Under Armour while playing football at the University of Maryland. 1996: Plank uses $20k of his personal savings and $40k of credit card debt to launch the company. At the end of the year, he has sales totaling $17,000. 1997: Plank sells $100,000 worth of product to twelve NFL football teams. 1998: Under Armour is asked to create uniforms for Any Given Sunday. 2000: UA takes off with National advertising campaigns. 2002: The company becomes carried in 2,500 retail stores. 2013: Under Armour acquires MapMyFitness for $150 Million. View the video below where Kevin speaks to a group at the University of Maryland about what it takes to be a successful entrepreneur.